Looking for the Best Yorkie Harness or Collar? 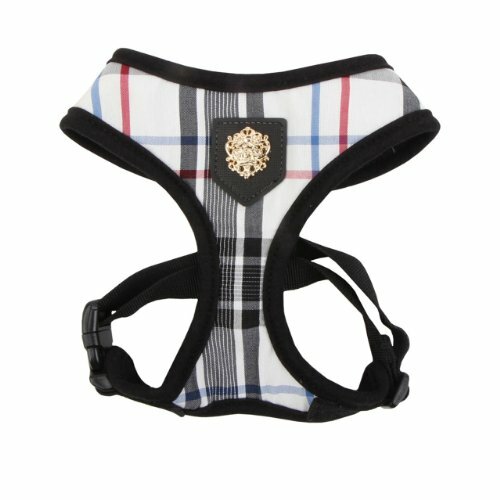 Home / Health and Care / Looking for the Best Yorkie Harness? Collar or Harness? Looking for the Best Yorkie Harness? Collar or Harness? There is no doubt that just like hairstyle is significant for the Yorkie’s appearance, harness and collar selection is one of the most important one, when it comes to your puppy accessories. However, a harness or a collar is not just another accessory to buy in order to make your Yorkie as fashionable and cute as possible. As a matter of fact, these accessories are also very beneficial for the puppy’s health. And let’s not forget that adding harness means you can establish a better and stronger control over your dog (in general, regardless its breed type), as well. So, up to now and before even getting deeper into this subject, we can by all means conclude that a harness or a collar can increase your dog’s quality of life. Though, what is best for the Yorkie, specifically – a harness or a collar? To answer this question it is a must to learn more about the differences and the similarities between them. In addition to this, getting the right answer starts with understanding the anatomy of the Yorkshire terrier, which is a top factor for a final selection. So let’s say a few words about canine neck anatomy at first. How does the Yorkie’s canine neck anatomy affects an owner’s choice for a harness or a collar? What’s the main difference between the harness and the collar? In a few words, when you use a collar, the entire pressure falls onto the trachea, which as you can guess, is not very safe for the tiny Yorkies. Moreover – in case of any dynamic, sudden or fast motion the dog does, the neck receives more and more pressure and eventually the fragile puppy simply cannot handle it. Of course, it is not about the dogs in general. There are dogs like the French bulldog, for example, that are fully able to bear such pressure. But Yorkshire terrier is not one of these tough breeds, by all means. When being pressed with so much tension, the puppy wearing down and neurological problems, as well as neck issues are almost 80% possible, especially in case of constant and long-lasting collar wearing – for at least 3 months. When force is suddenly applied to the neck, as can happen when on leash and collar, this can trigger collapsed trachea. And when such a thing happens to a small and fragile dog, a serious injury can be caused and really bad consequences are possible. Moreover – treatment methods in most cases are drastic (for example, surgeries) and quite long-lasting. Unfortunately, though, no vet can even give you guarantee that the treatment is going to be successful because sometimes, no matter how careful you are, it is not. And the side effects of both: the neck trauma and the treatment, itself, are quite awful, too: cough, trouble eating, intolerance for exercise and wheezing noises. Now you understand why entering a pet store, you are always offered a harness, but not a collar, when the shop assistant sees your Yorkie. The thing is that the harness is the better and smarter choice, because it is more delicate. Unlike collars, the harness fits around a dog’s upper back, shoulders and chest. Thus, the bones and as many muscles as possible are able to bear the pressure – including during faster running and long-lasting walking. The specific thing here is how you put it on the puppy – through the buckles. Choose between the sides and/or the upper back. Make sure to get an adjustable model, because the tiny sizes of the Yorkie really require it. Prefer the nylon webbing. It is more durable and water resistant. Plus – it is simple to be maintained. There are also special breathable models. They also call it the vest harness. Here is where we need to calm you down that many Yorkies do not only mind wearing harness, but also enjoy it. Some puppies even feel more comfortable when having such an accessory for protection. The only thing you need to care about is figuring out what the best model is. We truly suggest you to bear in mind the vests that the Yorkie wears and the connector for the leash is on the upper back just like the strap harness. What is the best Yorkie harness? Check out our hot pick-ups for a harness your Yorkie will really love! This cute harness is available in numerous pastel shades and suits your sweet Yorkie’s look at a full value. 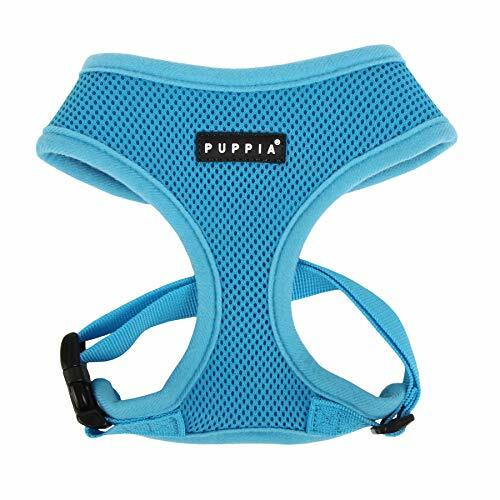 However, PUPPIA Authentic Vivien Pet Harness is so functional that once tried it, you will not want to change it. Ever! It has checkered frills around the neck with a ribbon and buttons as decoration. Plus – the model is coordinated with the Puppia Two Tone Leash. The coordination belt we were talking about above is available in this model. There are 4 size types to choose from. 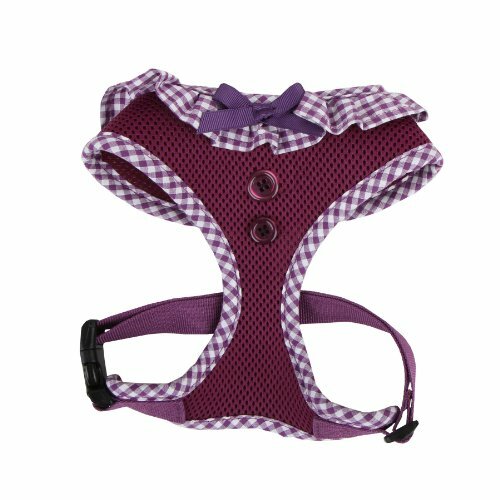 From XS to XXL, these various in colors harness is another smart choice you can make for your tiny puppy. The benefits shouldn’t be underestimated here, either. It is produced from 100% Polyester Air Mesh. This material is light-weight, breathable and very soft to the touch. This is a typical wrapping harness and it has 9 from 10 points for convenience – based on a research among 100 different dog breeds (including Yorkie terrier). The harness comes with soft edges (piping), as well as genuine Puppia rubber label on the chest portion, an adjustable chest belt with a easy snap on/off buckle and a And the best thing about the Puppia Soft Dog Harness is its D-ring. 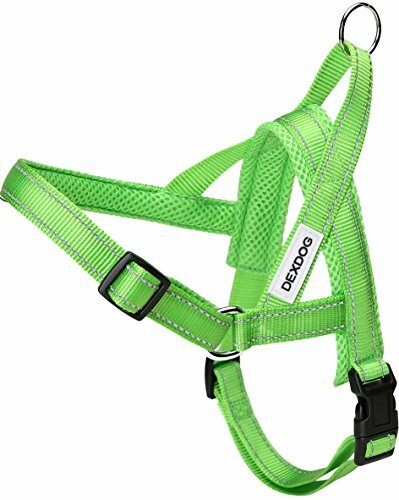 Located on the back, it is made to hook any standard leash onto the harness. Last, but not least, it is important for you to know that Puppia Soft Dog Harness was specifically made with small size dogs in mind. Also various in sizes and suitable for small size dogs like the Yorkie terrier, Puppia Authentic Junior Harness A joins the rest of the lineup in the A harness family. It has luxurious pattern with a hint of preppy look, as well as convenient adjustable chest belt, plus – a great matching lead in the same pattern. The model is a modern look towards different dog breeds that, though, usually need the same things like comfortableness and possibility to fall under its owner`s control without being injured or put under bad discomfort, while having a walk. Ok, we call it number one, but we aren’t the only one. According to Amazon, it is one of the most popular and loved dog harnesses of all times. And sure it is. The model has extra simple innovative technology to be adjusted and placed, which saves you time from making your dog getting under your control, when you are outside. Also, it has adjustable and reflective straps that allow for both safety and comfort. The dog harness handle is great for practicing no pull techniques and training with young puppies. Providing decent harness for your lovely Yorkie terrier is one of your main responsibilities you need to execute smartly and precisely. Hope this article will help you in your decision. Previous How to Cut a Yorkie Hair?